"A combination of sweet, tart tastes combined in this super easy dessert. Good warm with ice cream on top." In a saucepan over medium heat, stir together the cornstarch and sugar. Stir in the water. Cook, stirring constantly, until thick and bubbly. Stir in the cherry pie filling and almond extract. Set aside to cool. In a medium bowl, mix together the flour, oats, brown sugar and salt. Cut in margarine until the mixture is evenly crumbly. Press 2 cups of this mixture into the bottom of a 9x13 inch baking dish. Spread the rhubarb over the crust, then spread the cherry mixture over the rhubarb. Stir the chopped nuts into the remaining crumb mixture, and sprinkle over the top of the fruit. Bake for 40 minutes in the preheated oven, or until the top is crisp and golden. Serve warm topped with ice cream or whipped topping. I followed the directions exactly and I think next time I will double the rhubarb and skip the almond flavoring. It was way too sweet. This was very delicious, in fact, we liked the combination of cherries/rhubarb instead of strawberry/rhubarb. I didn't make any changes to it at all. Thanks for the great recipe! Excellent! I made this with frozen rhubarb, can't wait to try this with fresh, which will be coming soon. Hope other people try this as it is great. 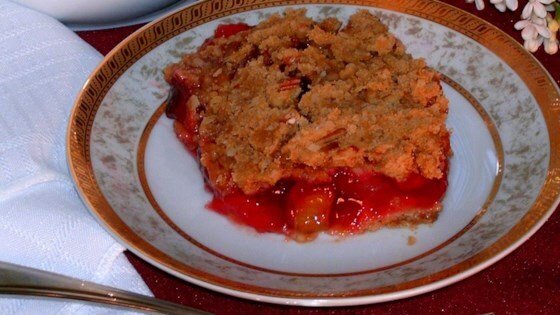 From rhubarb lovers in our house, we all give this recipe 5 stars! We were surprised by the cherries, but totally delighted with another way to enjoy our rhubarb! Very tasty recipe. I added only 3/4 cup sugar to the cherry pie filling and I still thought it was sweet. I have the strawberry rhubarb in my garden which is sweeter than regular rhubarb.